KawaiiPunk - Kawaii Mascot Blog: Thanks for the Chi Chi Memories! Ahhh… the sweet sensations of Spring. The first tentative flowers of the new year, the subtle hints of blossom on the cherry trees, and the beautiful melodies of songbirds on idyllic dew soaked mornings. It’s hard to imagine how things could get any better! But that doesn’t mean they can’t! Yes readers, it seems that Spring isn’t the only thing in the air for yours truly. Love has once again looked down and smiled upon me! And the object of my affections this time is the truly beautiful Chi Chi Memories. Chi Chi Memories is an adorable shop that sells, what can only be described as, sensational slices of kawaii crafting heaven! 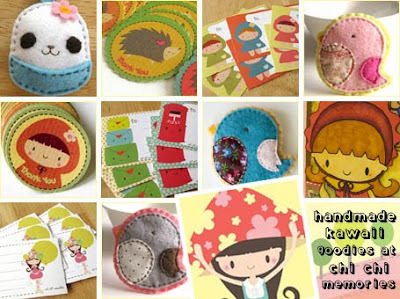 Its handmade treats are among the most gorgeous treasures you’ll ever see - beautiful birdy brooches, happy candy hair clips, and friendly felt charms are all there waiting just for you! It’s even got kawaii stickers, postcards, and note cards too! In fact, it’s got so many cute creations that you won’t just be spending Spring there, you’ll be spending Summer, Autumn, and Winter there too!